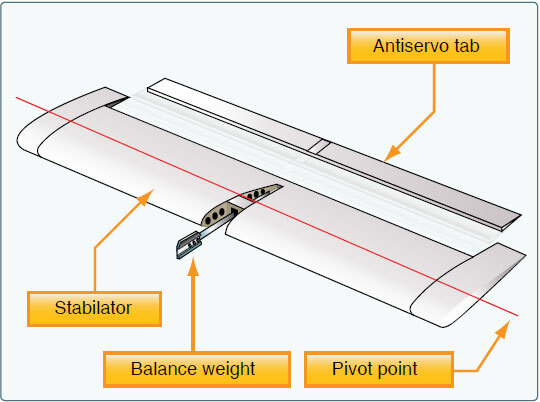 A stabilator is essentially a one-piece horizontal stabilizer that pivots from a central hinge point. When the control column is pulled back, it raises the stabilator’s trailing edge, pulling the nose of the aircraft. Pushing the control column forward lowers the trailing edge of the stabilator and pitches the nose of the aircraft down. Figure 6-13. The stabilator is a one-piece horizontal tail surface that pivots up and down about a central hinge point. Figure 6-14. 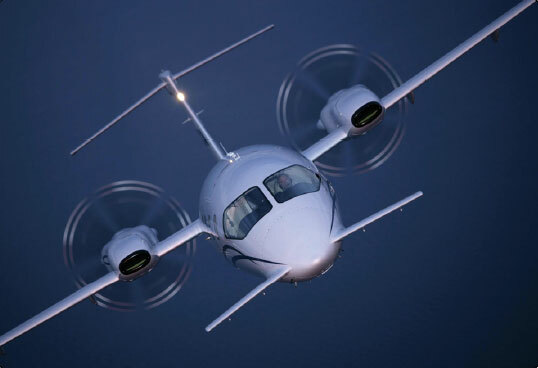 The Piaggio P180 includes a variable-sweep canard design that provides longitudinal stability about the lateral axis. The canard design dates back to the pioneer days of aviation. Most notably, it was used on the Wright Flyer. Recently, the canard configuration has regained popularity and is appearing on newer aircraft. Canard designs include two types–one with a horizontal surface of about the same size as a normal aft-tail design, and the other with a surface of the same approximate size and airfoil of the aft-mounted wing known as a tandem wing configuration. 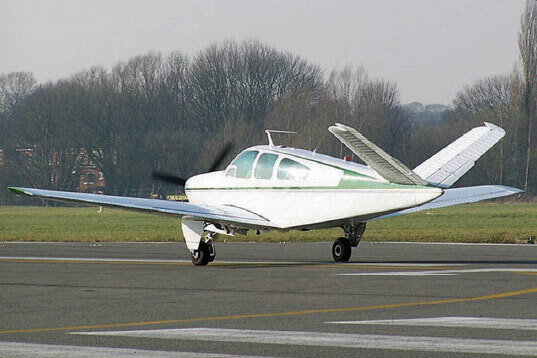 Theoretically, the canard is considered more efficient because using the horizontal surface to help lift the weight of the aircraft should result in less drag for a given amount of lift. The rudder controls movement of the aircraft about its vertical axis. This motion is called yaw. Like the other primary control surfaces, the rudder is a movable surface hinged to a fixed surface in this case, to the vertical stabilizer or fin. The rudder is controlled by the left and right rudder pedals. 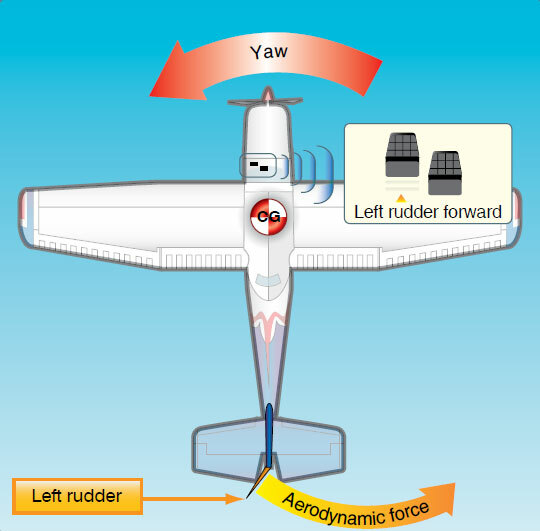 When the rudder is deflected into the airflow, a horizontal force is exerted in the opposite direction. [Figure 6-15] By pushing the left pedal, the rudder moves left. This alters the airflow around the vertical stabilizer/rudder and creates a sideward lift that moves the tail to the right and yaws the nose of the airplane to the left. Rudder effectiveness increases with speed; therefore, large deflections at low speeds and small deflections at high speeds may be required to provide the desired reaction. In propeller-driven aircraft, any slipstream flowing over the rudder increases its effectiveness. Figure 6-15. The effect of left rudder pressure. Figure 6-16. Beechcraft Bonanza V35. When both rudder and elevator controls are moved by the pilot, a control mixing mechanism moves each surface the appropriate amount. The control system for the V-tail is more complex than the control system for a conventional tail. In addition, the V-tail design is more susceptible to Dutch roll tendencies than a conventional tail, and total reduction in drag is minimal.